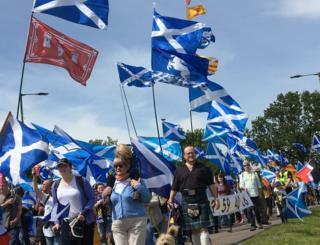 Thousands of Scottish independence marchers have taken part in a rally in Bannockburn. The event is one of a series being organised by All Under One Banner across the country. Similar events have already been held in Dumfries and Glasgow. Organisers and police estimated 15,000 people took part in Saturday's march. Participants left Kings Park in Stirling at 13:30 and walked just over two miles to Bannockburn. Bannockburn is where Robert the Bruce claimed victory over Edward II's English army in 1314. Further marches are planned for Dundee and Edinburgh later in 2018. All Under One Banner describes itself as a "pro-independence organisation whose core aim is to march at regular intervals until Scotland is free" and says it is open to "everyone who desires to live in an independent nation".